It has been raining incessantly. The rain is falling heavily. The sound is metallic when it falls on the car shed, it whispers when it passes through the trees. It sounds like strains of some musical instrument when it falls on our pond. The rise and fall of the wind speed gives rhythm to the sonorous music. The leaves seem to be studded with jewels with water droplets sitting on them. 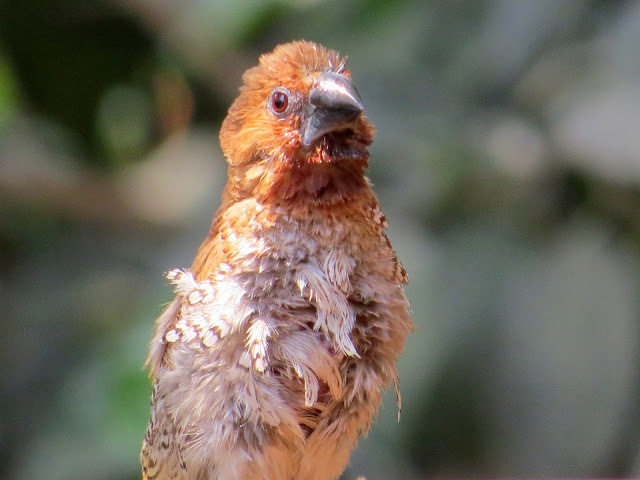 We spot a Scaly Breasted Munia enjoying the rain. Later in the day, it clears up. 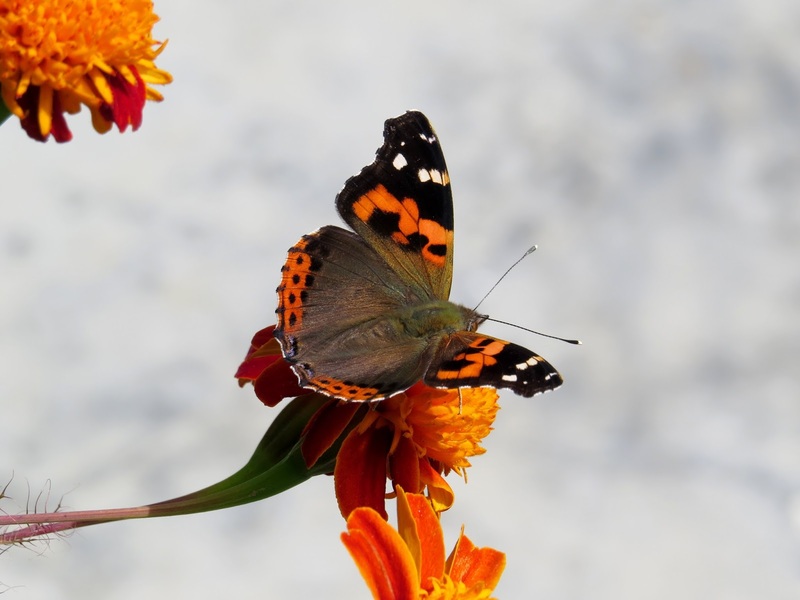 Sun shines through the clouds and butterflies begin to emerge from the bushes. There is a lot of hullabaloo in the kitchen. We are making breadsticks. The dough is being rolled to be braided. Kids are trying their hand at braiding. Younger one makes fat braids while the elder one braids tightly. Soon the baking tray goes inside the oven and the yeasty aroma fills up the nooks and crannies of our home. In the evening it begins to rain again and we enjoy our crisp breadsticks with thick tomato soup. Mix together first three ingredients. Cover and keep for 10 minutes. The mixture will turn frothy. Add to the yeast mixture and stir till well combined. Empty dough on a floured counter and knead for 5-6 minutes till it becomes soft, supple and elastic. Transfer dough to a greased bowl. Turn around once to coat it with oil evenly. Cover and keep for an hour or until doubled. Punch the dough and divide into two. Roll the first piece into a circle of about 12 inches in diameter. Cut 24 strips. Roll three strips one by one, at a time. Pinch the ends together and make a tight braid. Tuck in the edges on both the sides. Prepare all the bread sticks this way and place on a baking tray lined with parchment paper. Cover and keep for 20 to 25 minutes or until doubled. Preheat oven at 180 degrees C.
Those little braids are adorable! I bet they were amazing with tomato soup! Perfect for a rainy day! Loved your write up. 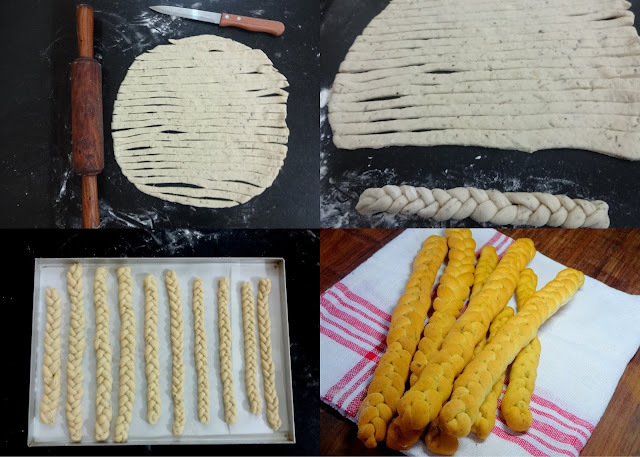 Beautiful bread sticks and what a patience! Kids helping out in kitchen is such a fun activity. I love this post and I love that you have the whole family involved in the making of these breadsticks. I have made quite a few of yourcakes successfully. You have adapted a few wholewheat cake recipes from other sites and have successfully used wheatflour instead of allpurpose flour. How do you know that a particular recipe will taste good if wholwheat flour is used instead of the originally used allpurpse flour? Hi! Thank you for trying out the recipes from my blog. It gives me great happiness. One can easily substitute all-purpose flour with whole wheat flour. Only the consistency of the batter needs to be checked. I generally use 3/4 cup wwf for every 1 cup of all-purpose flour. WWf gives a very nutty earthy taste to the cakes and is healthier too! 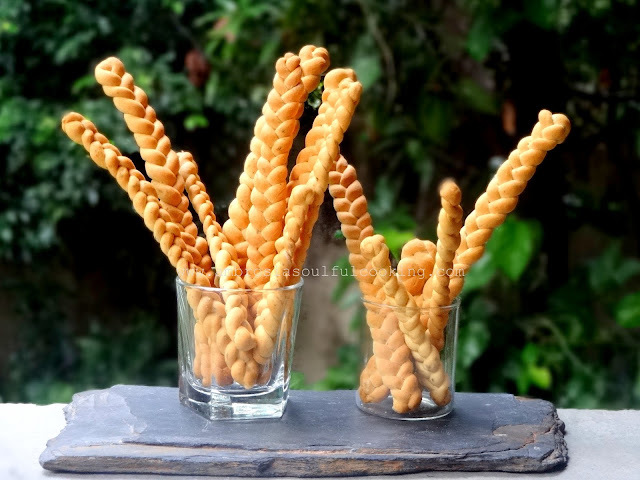 Braided breadsticks look so so cute... I've been scrolling up and down several times to admire the breadsticks, the bird and the beautiful butterfly. 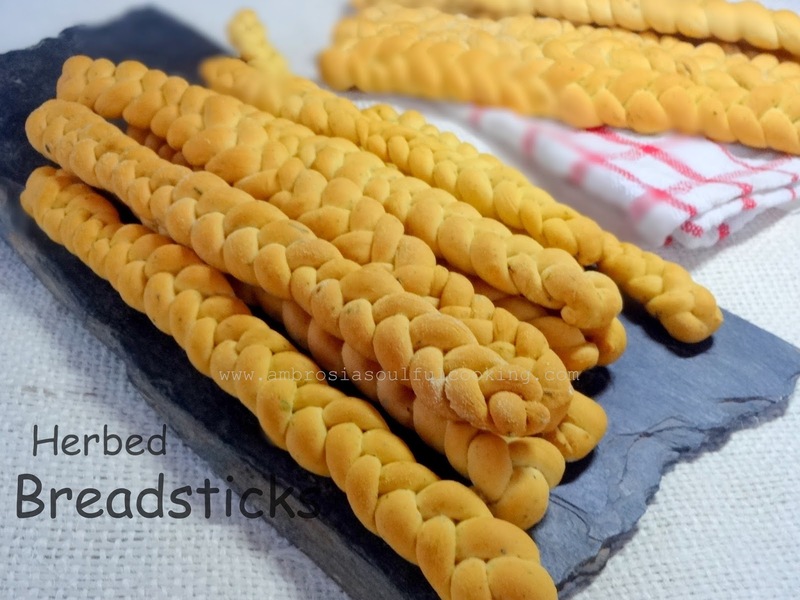 Wow, your braided breadsticks are just so cute and adorable. They make such a pretty and delicious centerpiece. 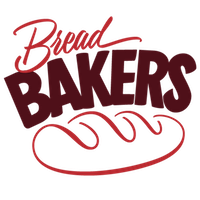 I have baked so many breads from your blog and one more added to the list. These look so cute namita!! wow this is amazing yaar!! love how it has turned out!! very cute and attractive, i bet it must taste great too!!! What a great idea! I would have been munching on these all day - they look fantastic!